Rehabilitating historic properties often involves introducing new systems or features to meet contemporary needs. These changes can usually be made in ways that are sympathetic to the existing structure and site. In order to accomplish a sensitive alteration, new features should be both compatible with the historic property and reversible. Solar panel workshop in Arizona. Adding solar panels to historic properties can have a significant impact on the character and visual qualities that covey a property’s cultural significance. Solar panel installations should not become prominent new elements that detract from the character-defining features of a building or landscape. To assist property owners, historic preservation commissions, and policy makers, we have developed guidance for applying the Standards for Rehabilitation to the installation of solar panels on historic properties. Additional guidance is available in ITS 52: Incorporating Solar Panels in a Rehabilitation Project which provides examples of compatible and incompatible installations of solar panels on historic buildings. 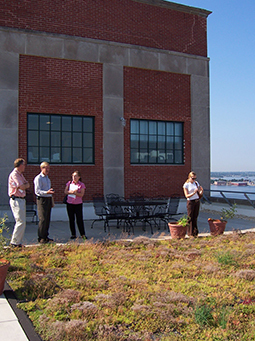 The one-time brewing headquarters of National Bohemian Beer and a favorite Baltimore landmark, received an eco-friendly renovation that features green blanket coverage of six different roof areas. Flat or low-slope roofs provide excellent opportunities to introduce a contemporary feature in a rehabilitation project. In several projects, such as the rehabilitation of the National Bohemian Brewery complex shown right, these areas have been adapted as green roofs. When planning to add a green or vegetated roof, structural capacity, visibility, and future maintenance must be considered before installation. For more information, refer to Green Roofs on Historic Buildings and ITS 54: Installing Green Roofs on Historic Buildings. In some regions of the country, wind mills are often characteristic and traditional features of the landscape. As the demand for alternative energy sources grows, the introduction of modern wind turbines in historic settings will likely become more common. Planning for the introduction of a small wind turbine on a historic property can benefit from guidance on new construction on the site of a historic property. Planners considering industrial scale installations that affect cultural resources should refer to the Guidelines for the Treatment of Cultural Landscapes.